ORLANDO, Fla. — For decades now, the circuitry-filled boxes mounted at the helm and bow of fishing boats were called fish finders. The electronic devices still find fish, but the latest innovations do much more. At ICAST, two fishing electronics companies introduced products that allow precision boat control to make finding and staying on top of promising fishing areas easier. The new innovations use GPS technology from the fish finder to control motors at bow and stern, depending on the brand. Lowrance and MotorGuide have integrated their trolling motor, GPS navigation and fish finder technologies. The end result is Pinpoint, a software interface that uses the fish finder to plot a course or recall a route at the desired depth or structure, among other functions. Pinpoint works when synced with a MotorGuide Xi5 and Lowrance HDS Gen2 or Gen2 Touch. The functions operate from the screen or by a remote control. The free software upgrade is available in September. Syncing requires a separate interface package. “The intuitive user interface makes it easy for anglers to create new fishing strategies, while the electronics and the trolling motor do the rest,” said Chris Meyer, key account manager for Navico, the parent company of Lowrance. Lowrance also introduced Outboard Pilot that syncs the HDS Gen2 or Gen2 Touch with an outboard motor. It works using the same Lowrance SmartSteer interface capable of steering the trolling motor. “Boat positioning is key and adding Outboard Pilot makes is easier for the angler to focus on fishing,” Meyer said. Outboard Pilot can steer to a waypoint or along a route, select a turn pattern or hold a constant heading and much more. It’s available in November at a suggested retail cost of $995. Minn Kota raised the bar on trolling motor functionality with the introduction of the Ulterra, which was named Best of Show in the boating accessories category on Wednesday. It features fully automated stow and deploy using a handheld remote control or touch of a footpad switch. Ulterra includes power trim, which raises and lowers the depth of the motor with the push of a button. Ulterra can be foot operated but it marks a first for trolling motors. A handheld remote can operate most all of the mechanical functions, from stowing and deploying to adjusting the shaft. And of course, putting the boat precisely on a fishing spot with the touch of a button. Minn Kota partnered with Johnson Outdoors sister company Humminbird to advance its already successful iPilot Link with a new software upgrade available this fall. One of the new features is Prop Auto-on. The prop automatically turns on whenever the user selects a Go To function recalling a specific waypoint. Like everything else, it too is available with remote control operation. Just when you’d think enough is enough with all of the technology, it’s really not to the consumer. 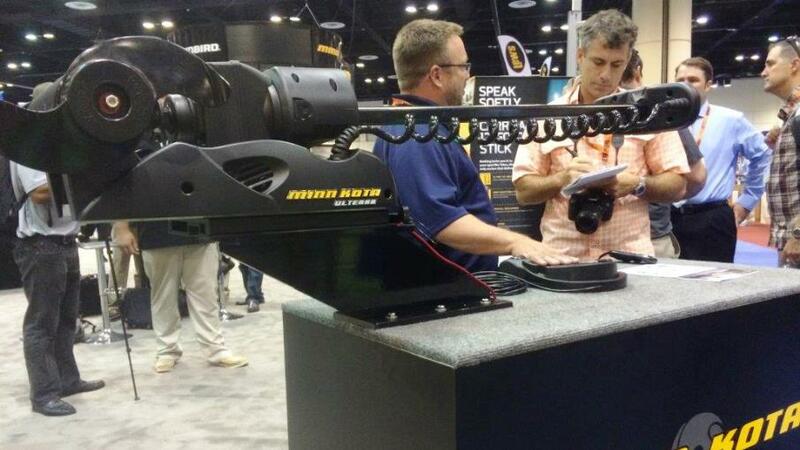 Minn Kota was the first company to bring GPS technology to trolling motors in 2010. The introduction of iPilot was a litmus test of sorts to see how anglers embraced such technology in their fishing. What happened next is what Maryanov described as an evolution. That led to the development of iPilot Link and now, the Ulterra. The venerable brands are competitors although they share a common agreement. It should soothe the minds of fishing purists crying foul over the technology. Could there possibly be anything else? “Absolutely, we’re always busy,” Maryanov said.